Is la fée verte—the green fairy—a benign or malignant force? Romanticized by artists and writers and condemned as a cause of dissolution by social reformers, absinthe, that famously green, astringent liquor, has only recently shed both extremes of its reputation. Really, it’s just strong alcohol. Very strong—50-72% alcohol by volume, making it 100-144 proof, depending on the variety. Both its rumored hallucinogenic properties, valorized by the bohemian set, and its supposed capacity to drive its consumers to depravity, promulgated by prohibitionists, have in the past several decades been revealed as part of a fascinating but largely baseless mythology. Just like any alcoholic drink, it’s neither inherently good or bad—nothing, aside from its high proof, distinguishes it from other spirits in terms of its effects on the drinker. Absinthe is distilled from a high proof spirit such as brandy, in which dried wormwood and other herbs have been steeped. Wormwood imparts a distinctive bitter flavor, while fennel (Foeniculum vulgare) and anise (Pimpinella anisum) lend the drink it licorice notes. Lemon balm (Melissa officinalis) and hyssop (Hyssopus officinalis) are added to some recipes. Wormwood in particular is the key ingredient—absinthe derives its name from the Greek for wormwood, apsínthion. Of the some 200 species of wormwood, which belongs to the Compositae family, grand wormwood (Artemisia absinthium) and petite or Roman wormwood (Artemisia pontica) are preferred. The latter is often used to give the drink its color. The use of wormwood as a flavoring agent is predated by its use as a medicinal herb, which dates back to the ancient Egyptians. It is first mentioned in the Ebers Papyrus, a medical treatise dated to 1551 B.C. The ancient Greeks and Romans used it too. Pythagoras of Samos and Hippocrates both suggested the use of wormwood as a pain reliever. And Pliny the Elder describes its ingestion by chariot racers as a reward for victory, claiming that its salutary benefits balanced its bitterness. The plant got its common name from its efficacy as a vermicide—that is, it aided patients in voiding parasitic intestinal worms. A 1597 herbal describes its utility as a moth repellent—which probably explains a lot to those averse to absinthe’s asperity. Wormwood’s use in the liquor that now bears its name dates to about 1769, when it is believed that two sisters by the name Henriod began selling an absinthe concoction as a health drink in Couvet, Switzerland. A doctor, Pierre Ordinaire, who moved to the same town in 1768, also began selling an absinthe drink as a purgative elixir in 1789; he patented it in 1792. Whether he obtained his recipe from the Henriods, whom he knew, or not, is the subject of some debate. In 1797, the recipe was sold by either the Henriods or Ordinaire to a Major Dubied, who, with his son-in-law, Henri-Louis Pernod, founded the Pernod distillery and began selling absinthe liquor. Another distillery was opened by the company in Pontarlier, France in 1805. Though initially restricted to the upper classes, absinthe consumption increased substantially after absinthe concoctions were served to soldiers participating in the Wars of French Algeria starting in 1844. The substance was meant to stave off helminthiasis, or worm infection, and malaria, but when mixed with wine, became a popular recreational drink. Returning soldiers continued drinking absinthe and in what some have speculated was an attempt to emulate these patriots, civilians joined in. By 1849, there were 26 distilleries producing the emerald liquor and by the 1860s, the five o’clock hour had become known as “l’heure verte”—when people getting off work would stop in the cafes for a drink—or several. As more-affordable versions were released, it became increasingly popular among the lower classes and gained particular cachet amongst the bohemians of the Latin Quarter and Montmartre. 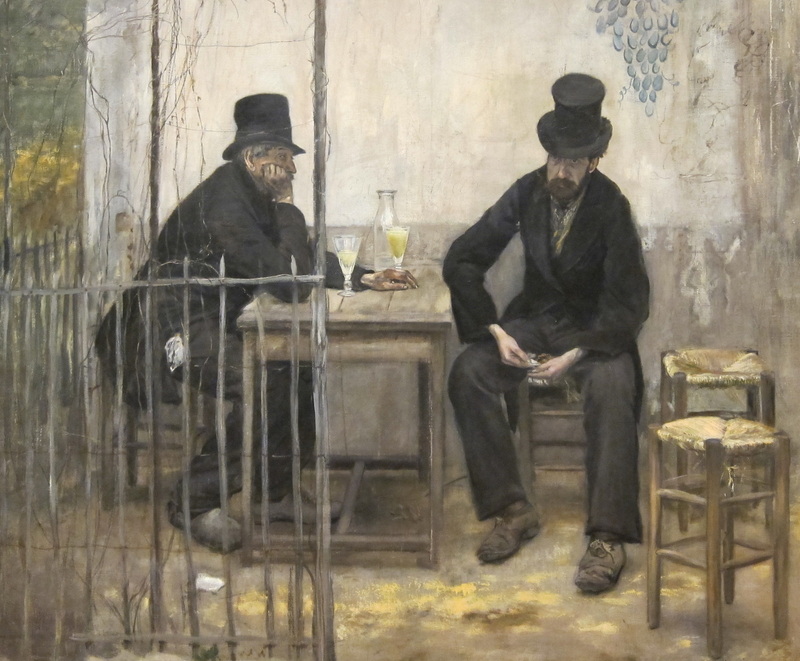 When Édouard Manet submitted his painting Le Buveur d’absinthe (The Absinthe Drinker), to the Paris Salon in 1859, it was summarily rejected for its grim depiction of a working class man lounging next to a glass of absinthe and an empty bottle. As was often the case, the academy proved out of step with the sensibilities of the artistic class. Absinthe won converts in artists including Henri-Toulouse Lautrec and Edgar Degas, whose 1876 painting Dans un cafe, depicting a morose couple drinking absinthe, was similarly derided at a Christie’s auction. Vincent van Gogh was a regular consumer of absinthe and painted it, along with the water used to dilute it, in 1887. Notorious sybarite Oscar Wilde was among the many writers to wax rhapsodic about the drink’s hallucinogenic properties, claiming to have seen a garden sprout from the floor of a drinking establishment after having indulged in an evening of absinthe. Poet Arthur Rimbaud dubbed wormwood the “sagebrush of the glaciers” and Charles Baudelaire included absinthe among the intoxicants listed in his 1857 poem “Le poison.” Gustave Flaubert took it a step further and dubbed it “ultra-violent poison.” It was practically de rigeur for the creative class of the Belle Époque. By 1874, an absinthe bar had even opened in New Orleans. Later appreciators included Ernest Hemingway, who mentioned it in several books, and Pablo Picasso, who included it in a painting (1901) and a sculpture (1914). In a number of poorly designed experiments he exposed dogs, cats, guinea pigs, and mice to wormwood oil in closed chambers or fed it to them. He compared the effects to those experienced by animals exposed to alcohol. The animals exposed to wormwood oil frequently died after experiencing seizures, while those exposed to alcohol simply became drunk. Magnan compared these experiments to the behavior he observed in his human patients, which included seizures, tremors, and amnesia. While some were skeptical of his results, by the 1890s, absinthism was a commonly referenced social ill. This combined with a general sense of a failing French culture, exacerbated by the country’s defeat in the Franco-Prussian Wars (1870-71), to turn sentiment against the absintheurs, or absinthe drinkers. The flames of reformative zeal were further fanned by the efforts of French winemakers, whose industry had been devastated by phylloxera aphids from the United States, to prevent the replacement of their product with the viridian poison. Ironically, absinthe had become more widely available when the expensive grape spirits previously used to distill it had been replaced by cheaper grain alcohols following the aphid infestation. In 1905, Jean Lanfray, a Swiss man who had had two shots of absinthe—along with an array of other alcoholic beverages—shot his wife and two daughters after returning home drunk. The prosecution insisted that it was absinthe that was responsible for his out-of-character behavior. Lanfray was convicted and several day later hung himself in jail. Within days, a petition calling for the prohibition of absinthe had amassed some 82,000 signatures. This was the beginning of the end for the poor green fairy. Though all of the depravity linked to absinthism was attributed by more sensible types to simple alcoholism, absinthe became an appealing scapegoat. In 1905, Belgium banned its sale. The Netherlands and Switzerland followed suit in 1910, as did the United States in 1912, Italy in 1913, France in 1915, and Germany in 1923. The United Kingdom, Spain, Portugal, and the Czech Republic, however, remained immune to the hysteria. Spain in particular became a hub of absinthe production in the resulting vacuum. That was where Hemingway had his first sip while he covered the Spanish Civil War. As it turns out, the skeptics were right. The anti-absinthe hysteria was all for naught. While some had long speculated that thujone, a compound found in wormwood, as well as in sage and other plants, might have been responsible for hallucinations experienced by absinthe drinkers, it has since determined to have no hallucinogenic properties. A member of a class of compounds called terpenoids, it does, however, have neurological effects. In high quantities, it can cause seizures due to its ability to suppress the action of gamma-aminobutyric acid (GABA) inhibitors on the brain. However, a 2004 study of unopened bottles of pre-ban absinthe determined that the levels of thujone in the drink were insufficient to have caused such symptoms. Magnan’s experiments used pure wormwood oil and thus exposed animals to levels of thujone far higher than those ever found in absinthe. The study also tested for the presence of copper salts, thought to be used as a dye in inferior-quality absinthe, and antimony, believed to have been added to mimic the “louche” of high-quality absinthe, which occurs when cold water is added, bringing the plant oils in the liquor out of suspension and giving the drink a cloudy cast. Both substances were hypothesized to have contributed to absinthe’s unique effects. Not so, it seems. The presence of both chemicals was found to be negligible. Though the European Union again legalized the sale of absinthe in 1988, Switzerland did not follow up with a national law until 2005 and France waited until 2011, having previously required that absinthe be labeled as a “wormwood-based spirit.” (Those national laws were largely redundant, as the EU legislation covered both countries.) The United States didn’t follow suit until 2007. The EU now limits the amount of thujone to 35 mg/L while the United States restricts it to an even-lower 10 mg/L. 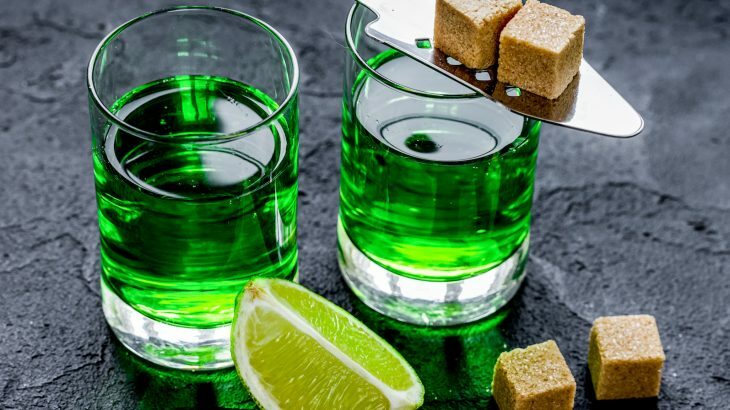 So, if you like the pungent flavor of the green fairy, and enjoy the ritual of dripping water over a sugar cube suspended above the glass, feel free to indulge. Just don’t expect to see flowers sprouting from the floor, or a winged Kylie Minogue flitting above the bar if you do.